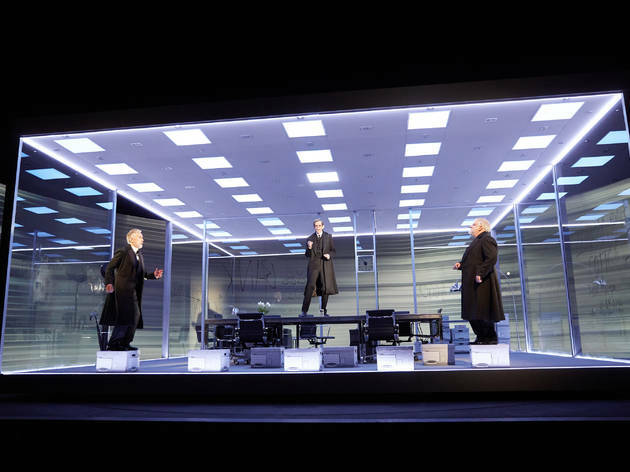 ‘The Lehman Triology’ transfers to the West End in 2019 with the original cast. Tickets go on sale Nov 2 2018. 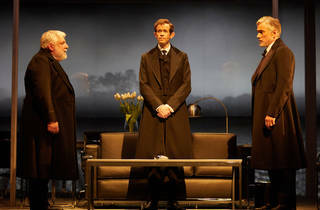 This review is from its 2018 run at the National Theatre. 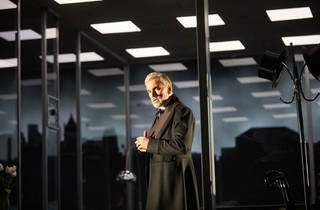 Sam Mendes’s recent forays onto the stage – ‘Charlie and the Chocolate Factory’, ‘King Lear’, ‘The Ferryman’ – have all been bombastic, blockbuster-style affairs that sparkle with the traces of his Hollywood success. 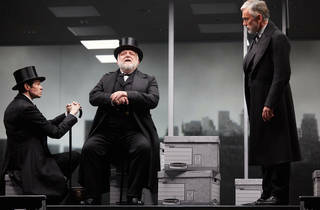 But he tamps it down with ‘The Lehman Trilogy’, an epic but fairly modest three-actor play that charts the story of the Lehman brothers and the institutions that would go on to bear their names. The original trio of Henry, Emanuel and Mayer Lehman arrived in the US as Jewish immigrants from Bavaria in the 1840s; the 2008 collapse of the bank that bore their name would effectively trigger the last great global recession. 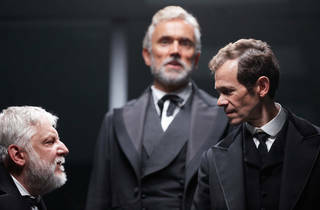 Written by Italian playwright Stefano Massini, and adapted by NT deputy artistic director Ben Power, ‘The Lehman Trilogy’ could be viewed as a sort of very fancy distant relative of one of those shows like ‘The 39 Steps’, in which a small number of actors play numerous roles, to the general delight of the audience. We’re talking about three remarkable actors, mind: the black-clad trio of Simon Russell Beale, Ben Miles and Adam Godley does not represent a great blow for diversity, but they are three white middle aged men at the top of their white middle aged game, and they turn a play that might have come across as a rather dry history lesson into a mostly electrifying one. Taking on the roles of both performers and narrators, the trio tell us the long, engrossing story of the Lehmans, who opened a humble general store in Montgomery, Alabama and proceeded to stumble into finance, with spectacular success. 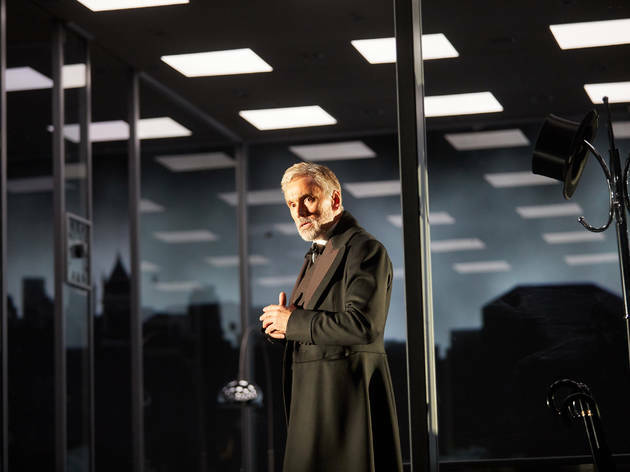 While it would not be a stretch to say the play is essentially about the evolution of Western capitalism over two centuries, and how modern America was shaped by the dreams of a generation of Jewish peasants, the journey is less thesis-like than all that. 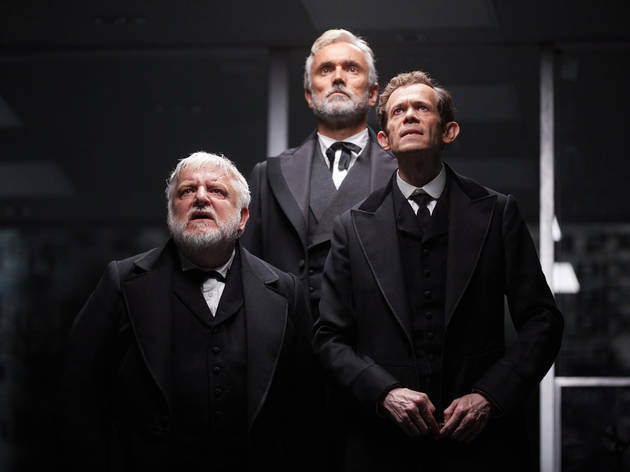 Funnier, too: all three men take on multiple roles, but the stocky, bearded Russell Beale is particularly amusing and vanity free as he tackles everything from self-regarding businessmen to dainty southern belles. 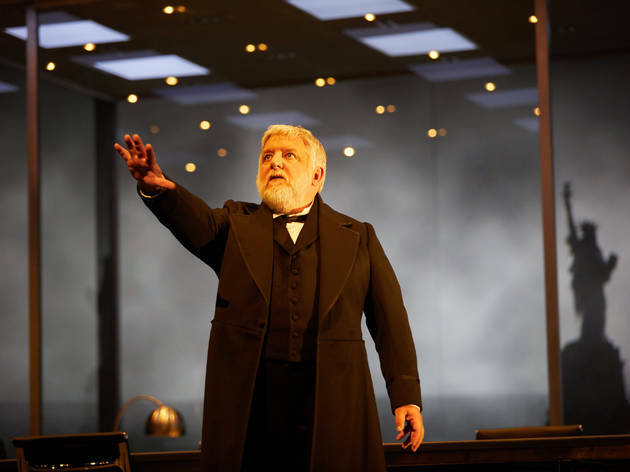 It’s basically a really, really good history lecture – imagine having Simon Russell Beale as your actual teacher! – beautifully framed by Mendes's team. Es Devlin’s revolving set is a spare, modern office, which serves as a canvas for an epic yarn that’s conveyed by the three actors, a live pianist, and Luke Halls’s gorgeous panoramic projections, which do the heavy lifting in terms of hopping between time periods, from grainy black and white shots of the antebellum south to the sweep of post-9/11 Manhattan. It’s an impressively ego-free affair from the three leads, who’ve all given way more virtuosic performances, but instead shelve the fancy stuff for authority, clarity, charisma, and the odd bit of great comic timing. 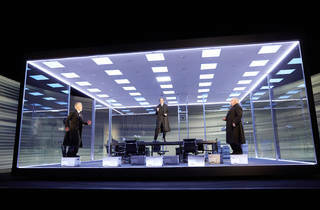 It’s a strength of the play, I think, that it aims to document, rather than editorialise. For instance, the original brothers seem to have no particular opinion on the institution of slavery, which they profited from as cotton dealers. 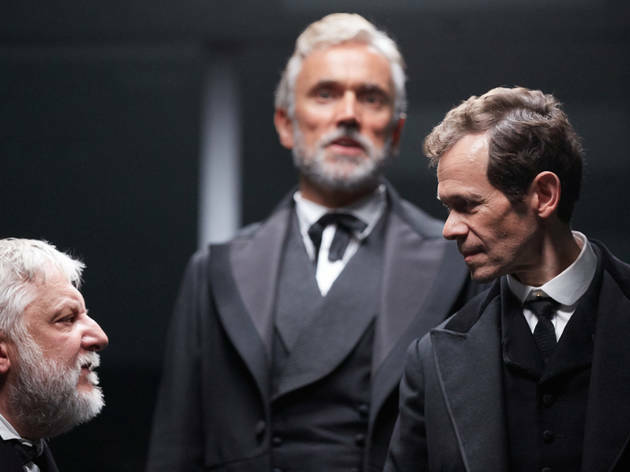 But rather than get bogged down in this, ‘The Lehman Trilogy’ instead forensically plots the joins between the cruel institutions of the south and the banks of north, and how the present system has all of them in its DNA. 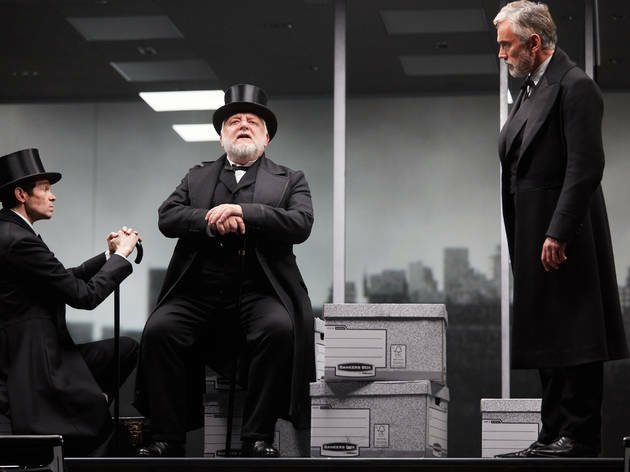 ‘The Lehman Trilogy’ does a great job of tracing the genealogy of the American dream back into its murkier constituent parts. It only hits choppy waters towards the end. 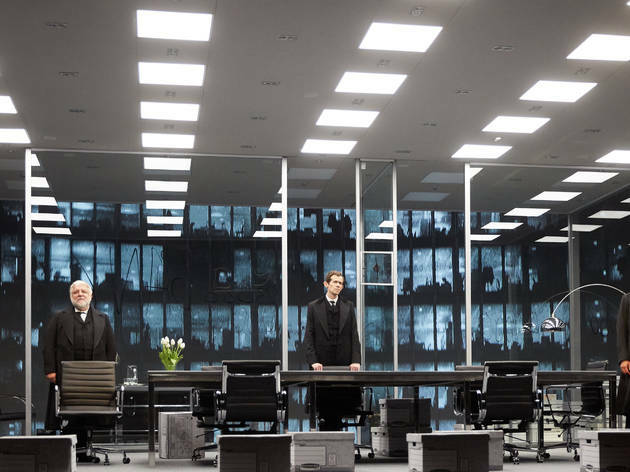 It would have been really dramaturgically convenient if Lehman Brothers had still been in Lehman hands in 2008, but in fact it hadn’t been since 1969, and the momentum ebbs from the story for the last few decades. 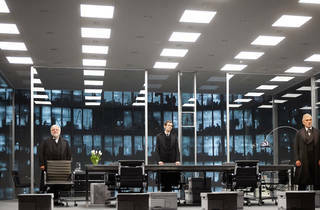 The text becomes more poetic and Mendes ladles on the directorial tricks – the stage spins faster, the visuals become more abstract – but with all the lead characters effectively gone, the last days of Lehman feel like a coda that might have been better tossed out in a couple of minutes. Still, with this director and these actors, a slight tail off at the death is not a major problem. 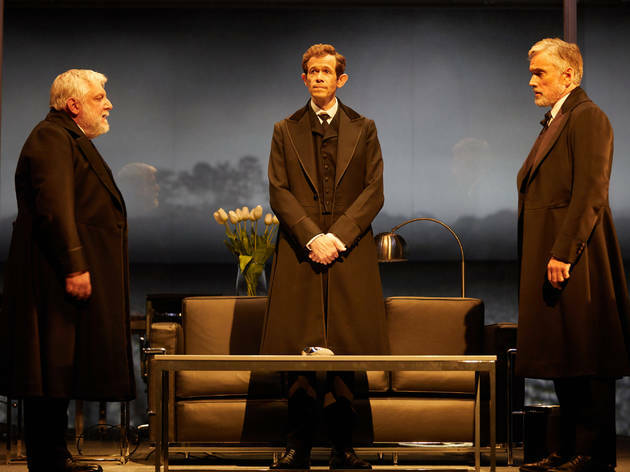 ‘The Lehman Trilogy’ is an elegantly told voyage through American history, and one that sheds plenty of light on the country’s present, turbulent shape. 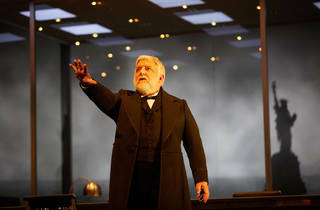 Okay I adore the NT and Simon Russell Beale is easily one of the best theatrical actors in the world. I was truly thrilled to see this play. I didn't even know it was based on the rise and fall of the Lehman Empire! I didn't spot the connection; but then I like to go into plays knowing as little as possible as I want to see the plot unfold in front of me; and that was exactly what happened. So 3 acts, no surprise there... the first act, just astonishing. No real set, just 3 actors playing many parts. Taking on different roles and narrating from different views throughout... it was the growth of the brothers' company... taking their original ideas and seeing them develop. Such a superbly fascinating true story. I adored it and walked away that they had really just sat down and told me a bedtime story in am expansive setting. who play the three Lehman brothers (& their wives/children/& grandchildren ......). My only concern is that the running time (3 hours / 20 minutes) is really not long enough to contain the full story. This is an astonishing piece of theatre, and I think it has the potential to develop further into a fascinating "box set".